We had so much fun collaborating with Tammy of Housing a Forest during our Play Inspired by Nature series that we have decided to begin a new, ongoing series together! 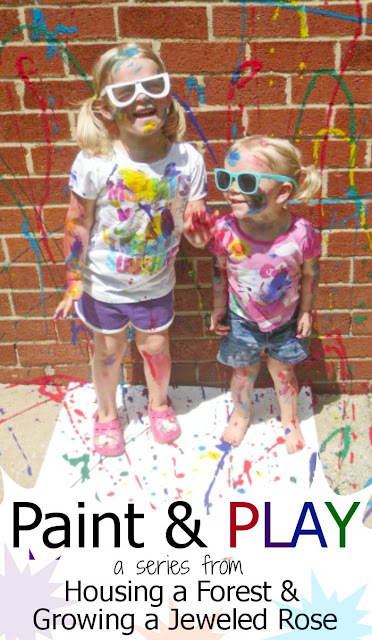 Today, we are both excited to debut our new creative series, Paint and Play! We have so many ideas for this series, and are SO EXCITED! 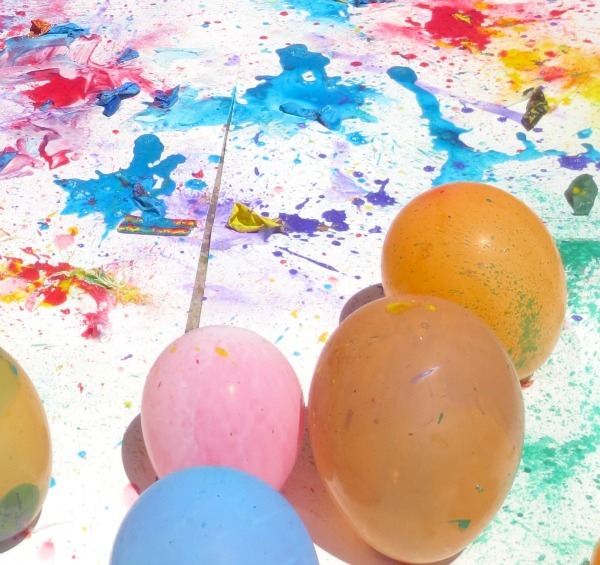 Today, we are debuting the Paint & PLAY Series with BALLOON ART. 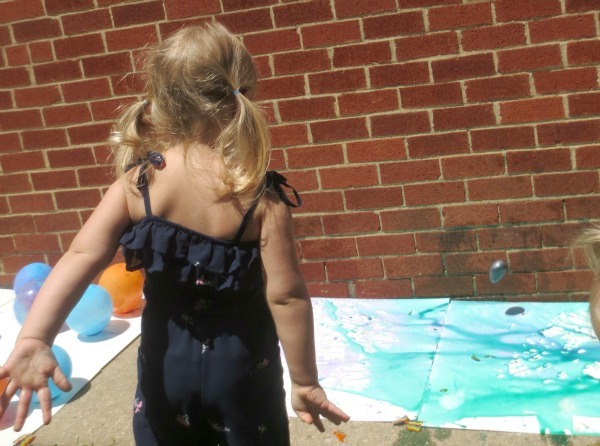 The creative challenge this week was to find ways to paint using balloons. 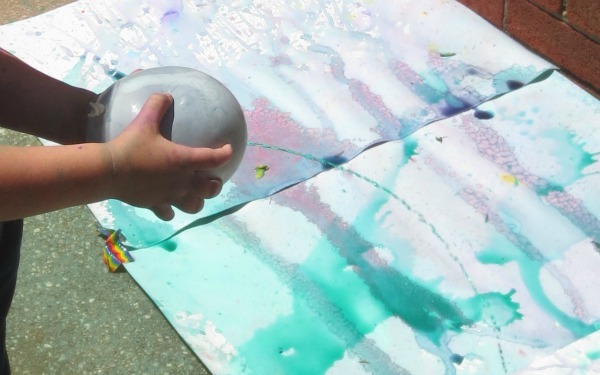 We tried 5 different balloon painting techniques to see which was the most fun! 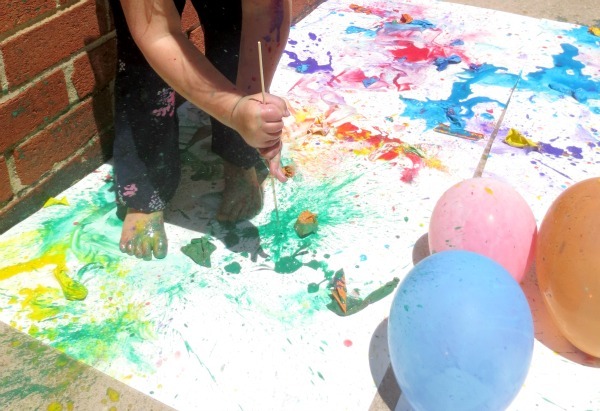 Balloon POP painting has been on our to do list for a long time now, and it definitely didn't disappoint. 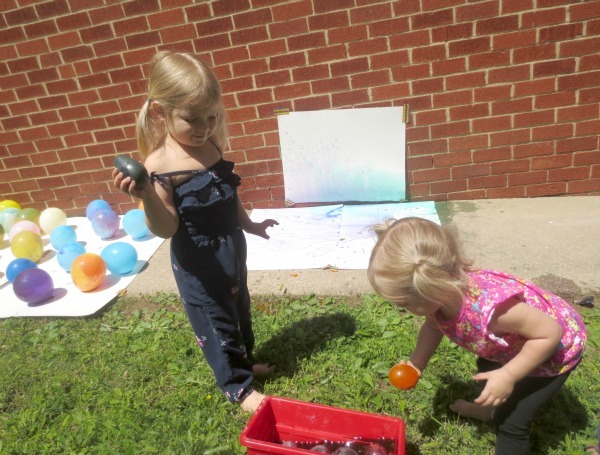 I filled about 40 balloons with paint and air so that Rosie and Jewel could pop them, and I only wish I had filled more. To fill the balloons I used a plastic condiment bottle with a long skinny tip like this one . I poured the paints into the bottle one by one. 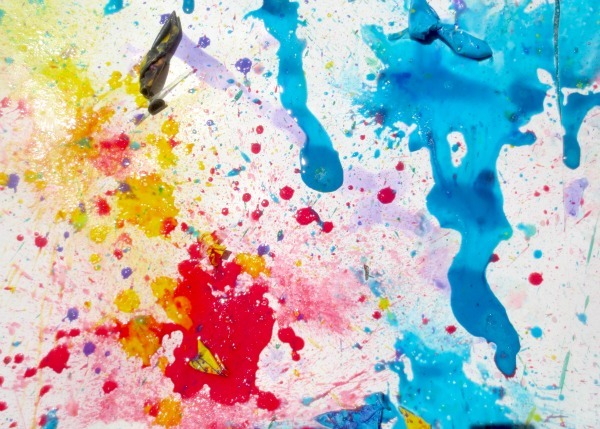 I watered each washable tempera color down a bit to save a little money and help the paint splatter from the balloons more. 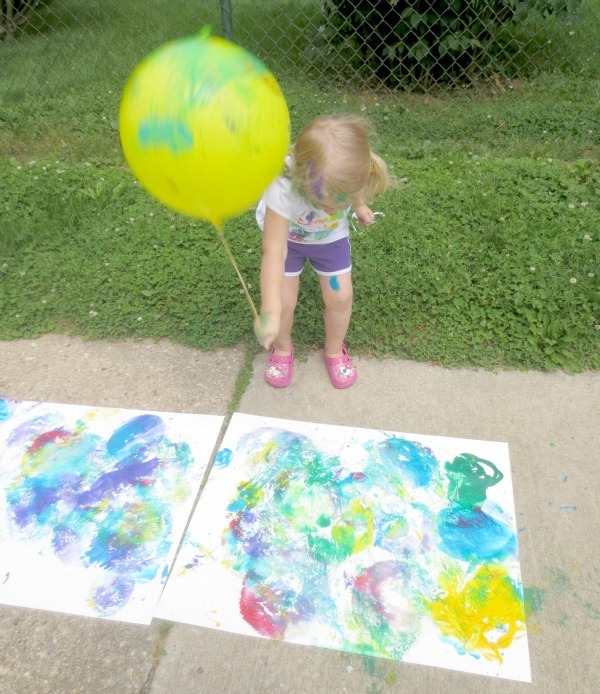 Then I squeezed the paint into the balloons and filled them with air. It was actually very easy once I figured out to use the condiment bottle. 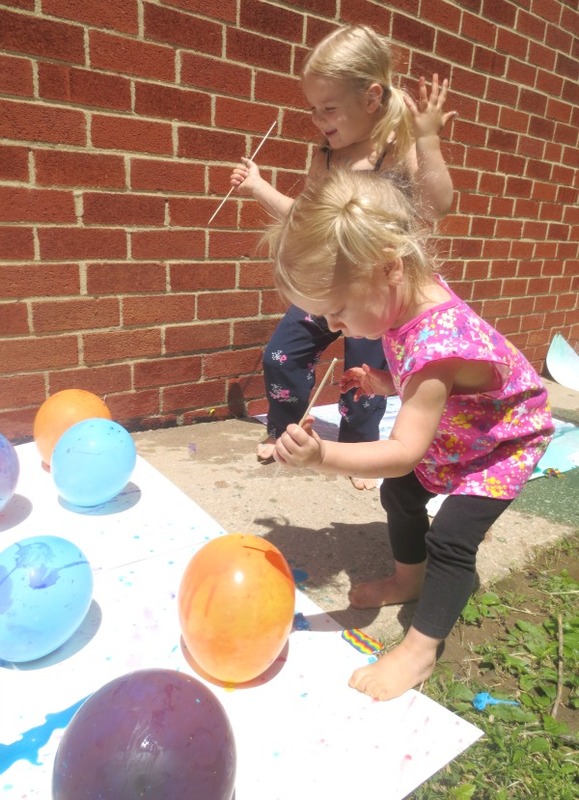 For older kids you can give them darts to pop the balloons, but I wanted to create a more toddler safe way to balloon POP paint so I gave Rosie and Jewel kabob skewers. This worked great! The only complaint was that the balloons went too fast. Rosie and Jewel LOVED popping them, and popped all 40 in a matter of minutes. 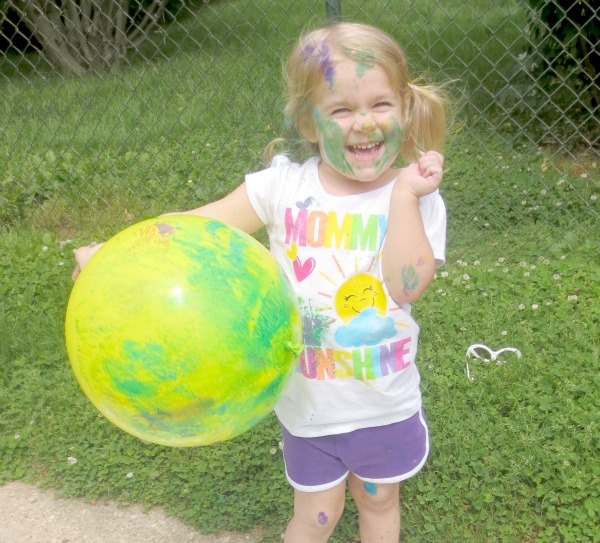 I would also recommend having your kids wear sunglasses to protect their eyes from paint splatter. Other then that this activity was SO FUN! The art was BEAUTIFUL, too! Set up for this was super simple, and Rosie loved the activity. I bought a pack of punch balloons from Dollar Tree (the big balloons on a rubber band), put out some paint piles on poster board, and let Rosie go nuts. 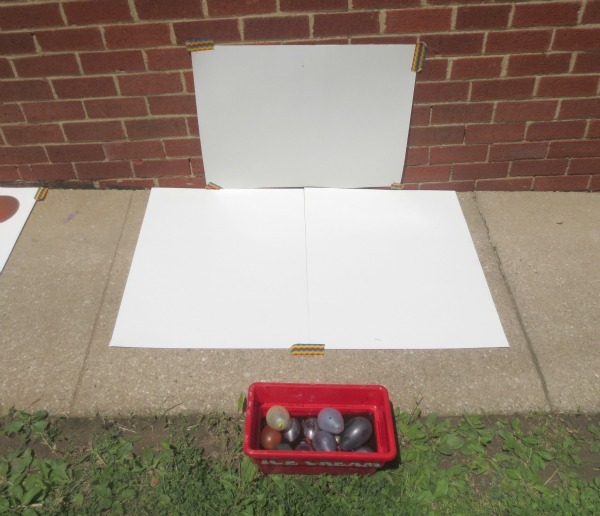 To make water paint balloons I used our pumpinator and filled it with watered down liquid water colors . If you don't have a water balloon pumpinator I highly recommend them. We bought ours last year, and it has been worth every penny! 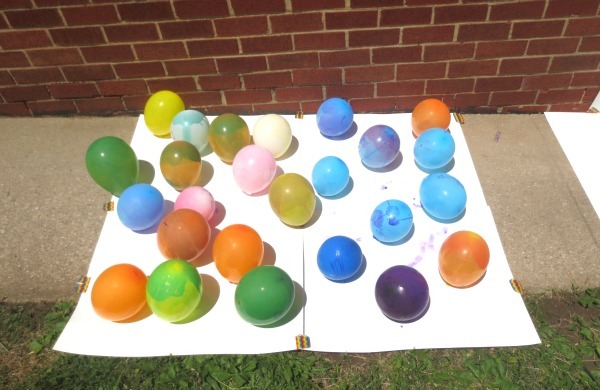 I let Rosie make a few water paint balloons for the experience of it, but I prepped most of them in advance. 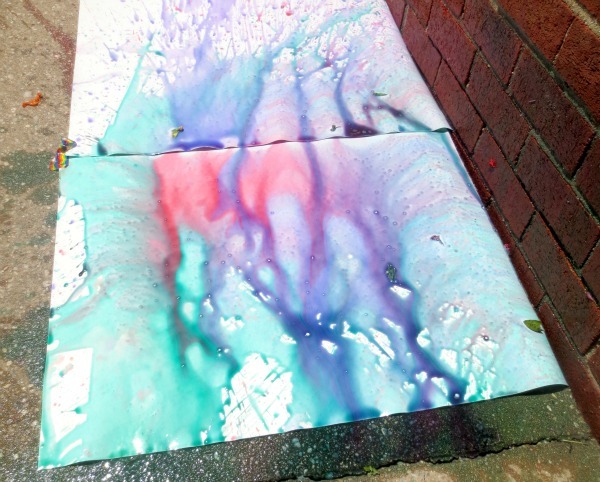 Then I hung poster board outside and let the girls go nuts. 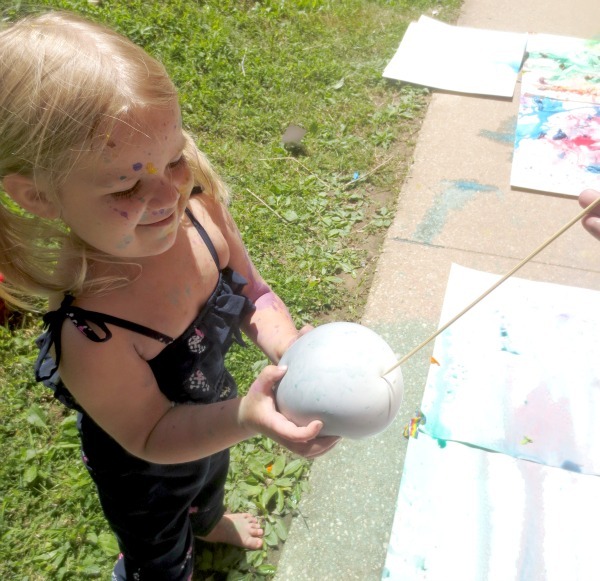 The girls loved water balloon painting! The art was really pretty, too! The water balloons did go fast, but they always do don't they? Next time I will make a ton more! 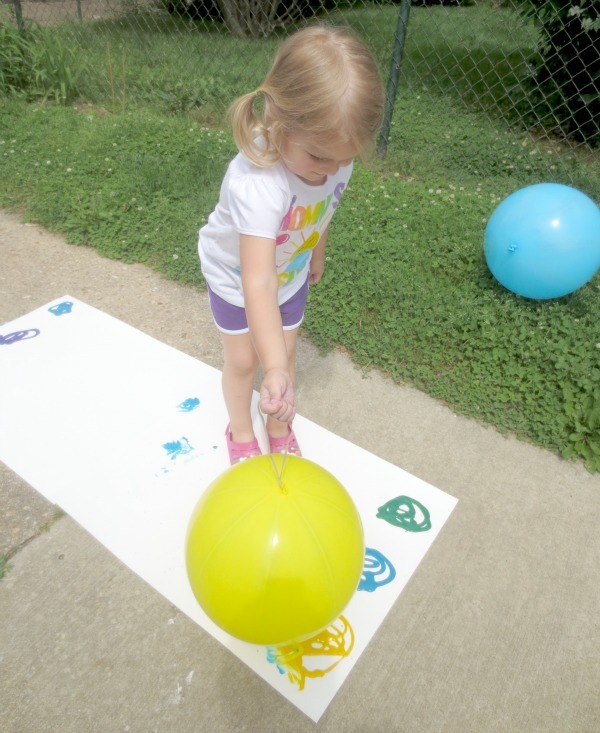 For easy peasy balloon painting we blew up a few balloons and painted with them, using them as a type of paint brush or printing stamp. 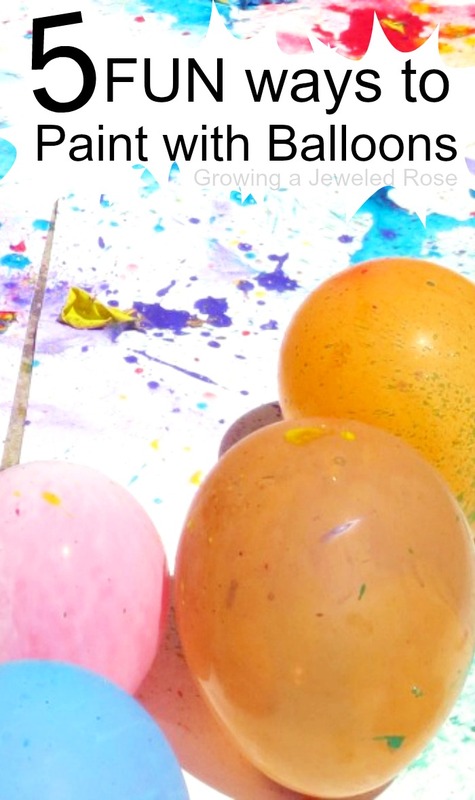 Just hold your balloon, dip it in paint, and paint! Any way you do it it's sure to be a BLAST! Safety Warning: Balloons are perfectly safe for kids to explore, but only with proper, diligent supervision from parents. 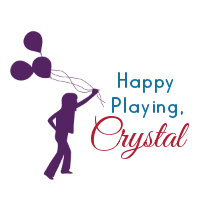 Please watch children closely, pick up balloon fragments quickly, and make sure they do not go into your child's mouth. Balloon pieces are a serious choking hazard so supervision is needed. 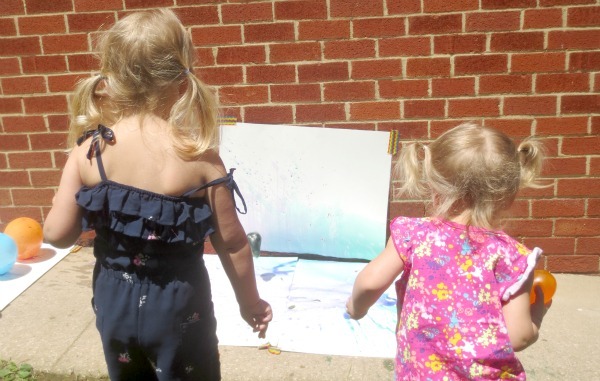 Stay Tuned Next Week for more Paint & PLAY!